What did I learn from the Peace Corps? Every returned Peace Corps Volunteer knows that the lessons learned during service can be enduring, eye-opening, even life-altering. For many of us, the two years we serve as a Volunteer can change our course entirely – how we see ourselves, how we see the world and how we determine our place in it. My Peace Corps service taught me that I could do anything… seriously, anything! I served in the mid-90s in Mali, West Africa. I lived in a mud hut, took bucket baths under the stars and ate far too much millet goo for breakfast, lunch and dinner. Learning a new language, understanding the culture, figuring out how to survive in the heat – yeah, it was tough at times. But I wouldn’t trade those two years for anything. Twenty years later, when I’ve had a hard day or suffered a setback, I think about all that I accomplished as a Volunteer: the challenges I faced head on and how serving and supporting my community compelled me to push through to the other side. Those two short years give me the strength I need to move through the tough times and the awareness to cherish the good times. My service showed me that I could accomplish anything if I put my mind, heart and soul into it. 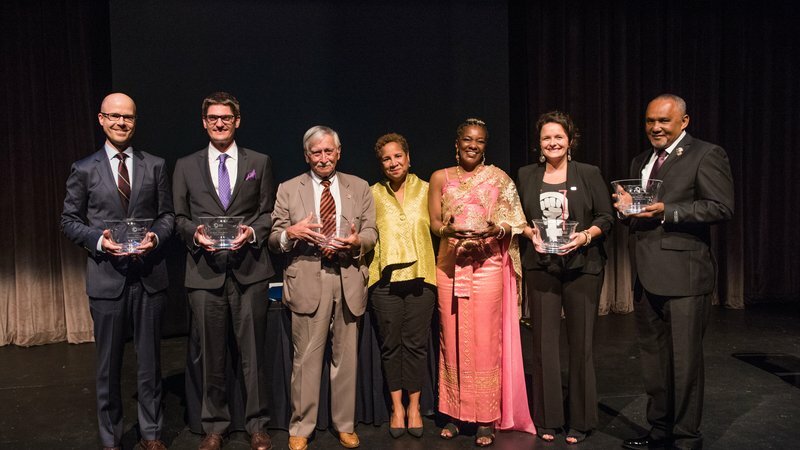 On September 23 in Washington, D.C., the Peace Corps honored six individuals who put their mind, heart and soul into their work every day. These six people are recipients of the John F. Kennedy Service Award. The John F. Kennedy Service Award is given every five years to individuals who go above and beyond in their efforts to achieve the mission and goals of the Peace Corps. The awards is given to two currently serving Volunteers, two Peace Corps staff and two returned Peace Corps Volunteers. What did I learn being a Peace Corps staff member?" How do you sum up culture and diversity? It’s so much. We change stories all the while, and compare, so there’s a lot of things I’ve learned over the years. And before working for Peace Corps, I just knew a few parishes; now I know Jamaica back to back. Really and truly, Peace Corps Volunteers helped me to really know some of the nooks and crannies of Jamaica. During service, many Volunteers discover that they want to “save the world.” After time in their site, they are so struck with the knowledge that we are all connected that they viscerally want everyone to have the basic things that affirm our human dignity – food, shelter, education, etc. When Volunteers talk about wanting to save the world, many feel silly or sentimental. Some apologize or blush. Peace Corps taught me that the work required to pursue these things is anything but silly or sentimental. Rather, it is one of the hardest, most demanding expressions of love that I have experienced. "What did I learn being a Peace Corps Volunteer?" In my service as a Peace Corps Volunteer in Thailand's youth in development program, I learned to recognize my purpose is anchored by passion and execution of duties. If you want to create projects that leave a lasting impact, you have to believe beyond your parameters and work from every angle. Willingly accept and respect unfamiliar lifestyles in order to adapt to cultural values. Consistent professional demeanor is necessary to gain respect and develop diverse relationships. Most importantly, I learned to trust my intentions, let go of perceptions, and live every moment in fascination. One of the most important things I’ve learnt from the Peace Corps is that “the gift must always move.” An attitude of graciousness united with action that has continued to shape my worldview. We all have the responsibility to reflect upon the gifts we have received, whether they are skills, material wealth, connections, etc. and utilize those gifts to contribute to a more egalitarian world. For me, this has required self-reflection and awareness, and also an understanding of when to step down from power and work to create spaces that encourage and celebrate the gifts and strengths of others. In my case, I was a Volunteer in Colombia [from 1964 to 1966], then staff and finally a Peace Corps Response Volunteer four times. In my family, my brother Ron was a Volunteer in Peru, perhaps making us the first to serve at the same time. Peace Corps has given me an awesome future, a Colombian wife, a son born in Colombia, [a job as] country director to Volunteers in Argentina and Uruguay and a Peace Corps and host country family that cares about me, motivates me, is honest and has given me friends I love deeply... what more do I want in life? I continue to ask, "Where would any of us be had there never been a Peace Corps?" how to use a cellphone. how to speak Maya Q’eqchi. to keep a low profile. to eat whatever was in front of me. to eat hot chilli with every meal. about a 36-year civil war. physical humor crosses cultural boundaries. to make radio announcements to reach far-off villages. what living on a dollar a day looks like. not to be quoted on the national news. what healing someone feels like. Barbi Broadus is a project coordinator at the Peace Corps. She served as a Peace Corps Volunteer in Mali.